26 September 2013, at 12:00a.m. Better surveillance of farrowing reduced the rate of stillborns on participating farms in Denmark from 13 per cent to around 10 per cent. An efficient strategy for farrowing supervision and obstetric assistance may help reduce the percentage of stillborn piglets. Piglets can be saved simply by optimising routines within normal working hours. The percentage of stillborn piglets can be further reduced with the use of staggered working hours where one staff member is present in the farrowing facility at most farrowings. These are the preliminary conclusion of a study made by PRC in spring 2012. All sow farms in the study were visited by an adviser from the Farrowing Manage ment Expert Group who analysed all routines before and during farrowing. Routines were optimised according to the recommendations of the farrowing guidelines. This was followed by a period of implementation when owner and staff incorporated the new routines. Systematic supervision of farrowing sows once an hour. During supervision, it was recorded which sows were receiving obstetric aid and how many live and dead piglets each sow had at the time of supervision. On some farms, recordings were made of all farrowings, regardless of whether obstetric aid was administered. At each round of supervision, the following were recorded: time, live and stillborn piglets, obstetric aid and how many live and dead piglets were pulled out during obstetric aid. This provided a good outline of the farrowing course and made it easier to pinpoint sows that could experience problems. Obstetric aid to sows that had not delivered a piglet since the last round of supervision. Upon transfer to the farrowing facility, sows known to have problems during a previous farrowing were marked with a coloured sow card or a peg when entering the facility. Each individual farmer defined what characterised a problem sow; it might be a sow with previous complicated farrowings, sows above a certain age, fat sows or sows that for some reason were not completely fit for farrowing. Obstetric aid was administered to these sows after 30 minutes if they had not delivered more piglets. These were the most important measures implemented in all herds. Management of body condition during gestation to ensure correct constitution before transfer to the farrowing facility. Fat as well as thin sows have an in­creased risk of delivering stillborn piglets. Banning the use of oxytocin during farrowing. Besides the fact that it is illegal to use oxytocin during farrowing, it also increases the risk of piglets suffocating from lack of oxygen in the birth canal. Correct feed dose from transfer to the farrowing facility and until farrowing. It is essential that the sow has the energy to farrow but she should not be overfed. Correct timing of transfer to the farrow­ing facility. 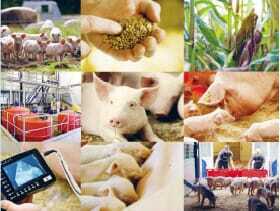 Sows transferred too late will have high stress levels during far­ rowing which increases the percentage of stillborn. If, on the other hand, they are transferred too soon, they will lack the exercise they would normally get in the gestation facility, which may also increase the percentage of stillborn piglets. Peace and quiet. If the general level of unrest in the farrowing facility is high, sows will move their farrowing to night time when things are quieter in the facility. All measures were adapted to the individual farm. Figure 1. Trend in percent stillborn of all piglets born. The bold black line indicates the average of all farms.